Overall, Mr. Bacigalupi has written a very good story that masterfully extrapolates current trends, especially regarding genetic manipulations, and shows us the kind of world they can lead to. Having read it all, I would give it three out of five stars. My earlier judgement of it as excellent was based on the beginning plotline and my enthusiasm for the author's depiction of the future world. If the plot was stronger, I would have given it a fourth star. 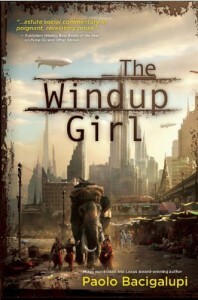 The Windup Girl is a good read, especially if you enjoy viable depictions of the future state of humanity with a dark and cynical edge.